Because bankevair forgot to hand over his journal and I found this possum on the open air staircase at work 2 days in a row, I thought I would share this photo of raydance's travelling Mr Grumps with the local wildlife. 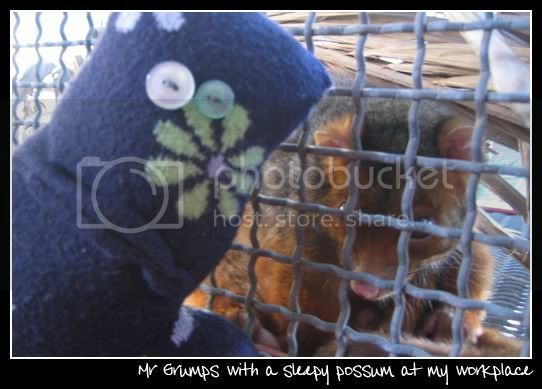 Mr Grumps and a grumpy possum - a perfect match. Have you got someone to take care of him? If not, I know just the person. Oh, it's fine. It has just been sleeping in the same spot under a fallen palm leaf on the other side of the mesh wall of an open air staircase. It hasn't even been bothered by the butcher birds or magpies in the area. Ah! I mistook the mesh wall for a cage. Nah, I don't think we bother to trap possums here. Too many of them and they generally don't bother the population, since we generally knock off work around 4:30pm (3pm on Fridays). Ohhhh Mr Grumps! How are youuuu. Grumpy from being squashed in my bag everyday. All you need is Severus Snape and you'd have perfect grumpiness!